This episode features is a powerful, heartfelt conversation that I’m honored to share with you. My guest is Kayce Stevens Hughlett, a psychotherapist, life coach, spiritual director, and speaker, and the author of three books: As I Lay Pondering: Daily Invitations To Live a Transformed Life, her novel Blue, and her journey memoir, SoulStroller: Experiencing the Weight, Whispers, & Wings of the World. Kayce and I have been friends for many years, and she was a compassionate listener and empathetic friend as I was going through some of my most challenging years with Asher. 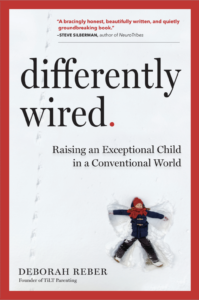 At the time, Kayce was a few years ahead in her journey with her own differently wired son, who was in his early twenties. I wanted to bring Kayce onto the show to talk about what she and her family went through when her son, as a young teen with an ADHD diagnosis, got involved with drugs. I know that this is a possibility many parents with atypical kids fear, and in fact some listeners may be in this very situation today. Hearing Kayce tell her story and share how she not only got through it, but how her family emerged on the other side more engaged and connected, is incredibly powerful. I hope you find her story as inspiring as I do. About Kayce:Kayce Stevens Hughlett started her writing career as a blogger in the early 2000’s and found her voice as a contributor to several collections and online publications. Now she is the author of three varied yet beautifully intertwined and popular books. Her 2012 nonfiction book, As I Lay Pondering: Daily Invitations To Live a Transformed Life, is a lyrical and lucid treasure that invites readers to new awakenings throughout the year. Blue: a novel, an award-winning study of three women in the Pacific Northwest, released September 10, 2015. Her journey memoir, SoulStroller: experiencing the weight, whispers, & wings of the world, was published in November 2018. A native of Oklahoma, Kayce and her family relocated to the Pacific Northwest more than twenty-five years ago. Her first career was as a posh accountant in a downtown high-rise, now she’s an artist of being alive and speaker practicing creative lifestyle coaching around the world.